CNN’s Brian Stelter is a must-follow on twitter. While some media personality twitter feeds don’t show much personality, Stelter’s is a virtual window into his thoughts. And it’s fair and balanced–far-left Trump haters get retweeted, but so do media establishment Trump haters. 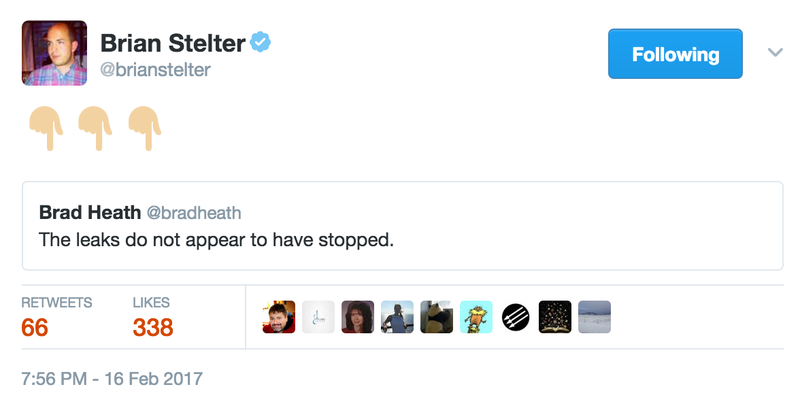 This was a retweet + comment from Stelter; in this case the pointing fingers constituted Stelter’s contribution. A perfectly reasonable RT, even though it’s devoid of any actual details, sourcing, or verification. But maybe that’s why Stelter pointed to it with only three fingers. This is an artist’s conception of how that tweet looked; it was deleted before a screen grab could be made. But it was seen, however briefly, by any Stelter follower watching their timeline when he sent it. The Cable Gamer has confirmation from others that they also saw this tweet, and its peculiar, inexplicable extra emoji: the laughing face.
.@brianstelter Why did you have a laughing emoji along with the pointing finger in your first (deleted) RT? More than three hours and over a dozen Stelter twitter entries later, CNN’s fearless media critic has not replied. @TheCableGame a typo. i meant to "point" twice, as i usually do. but hey, you found a way to make a whole blog post out of it. #content! His network is so full of hate. This post updated with Brian Stelter’s explanation: a typo. I’m not familiar enough with the fine points of twitter to know how likely or not this is–it took me a while just to figure out how to type an emoji into a tweet but when I did so, the laughing face was in an entirely different group from the pointing finger. The Cable Gamer is the furthest thing from an expert on this so Mr. Stelter’s statement stands.